Maintenance of a safer, cleaner and healthier environment is must in healthcare facilities, such as aged care homes, hospitals, child care and schools. One of the ways to achieve this is through the introduction of colour coded cleaning cloths, which allows specific tasks to be colour coded to the cloth, as well as specific areas matched to a certain colour cloth (eg kitchens = green cloths). Distinct colours for different purposes greatly assists in preventing the spread of germs and avoiding cross contamination. 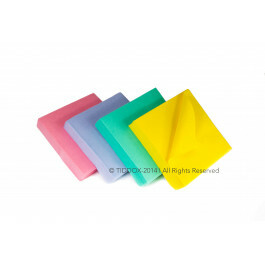 In line with these hygiene requirements, TIDDOX has introduced its colour coded absorbent cloths, called MAXI WIPES, which conform with the standard healthcare colour coded tables. These thick wash cloths are popular for their soft texture and fast sponge absorption capabilities, and of course are colour coded. For example, green color wipes are used for kitchen cleaning and food preparation areas, while a red colour denotes the bathroom and toilet cleaning wipes. Similarly, blue is meant for general cleaning and yellow indicates a color coded cloth for specific tasks. Because the MAXI WIPES are so thick and so soft, they are an ideal option for swabbing and patient care. Also they have enormous absorbency capacity, which makes them popular in aged care and child care, where unexpected spills occur reqularly and need to be absorbed rapidly. MAXI WIPES are much more effective than regular surface cleaning cloths. They are much thicker and much more absorbent. Their durability and long lasting life make them a clear favourite, particularly as they can be disinfected, washed and reused, which significantly reduces the cost per wipe. This method of sterilsation significantly reduces the chance of infection and cross contamination by germs and bacteria. So if you are looking for a quality, healthcare wipe, and colour coding is important to your requirement, give the MAXI WIPES a try! You will soon see that the cost savings do not mean a compromise to quality, and TIDDOX's commitment to quality without compromise will be self evident after first use. However, where there is a requirement for single use disposable healthcare wipes, other options to consider are the RAG-ON-A-ROLL, the OMNIWIPES, and the ANTIBACTERIAL WIPES ON A ROLL.